List of 28 news stories. Birchwood students in grades 6-8 participated in a qualifying round of Future Problem Solving where after extensive research, they used a complex six-step process to outline the problem, solutions, and action plan regarding food waste and loss. Due to their outstanding performance, 23 students will be moving on to the state level competition at Solon Middle School on April 12th and 13th. On Saturday, March 16, with cold temperatures and a brisk wind blowing, 54 Birchwood sixth, seventh, and eighth graders were undaunted as they competed at the district level of the National History Day competition held at Case Western Reserve University and the Cleveland History Connection. With a mixture of nervousness and excitement, students presented their projects to a team of judges and were evaluated on the historical quality of the projects, the connection to the theme of Triumph & Tragedy in History, and the overall quality of the presentation. The results were outstanding, with 23 students advancing to the state competition with a total of 13 projects. 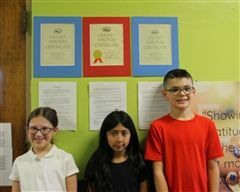 Three Birchwood students in grades 3-4 were delighted to learn that the transformation stories they submitted in the Cricket contest earned national recognition. Maliha earned second place for her piece entitled, “My New Hair.” Johnny, who wrote “Caterpillar,” and Caroline who wrote “Wiggle, Wiggle, Caterpillar,” received honorable mention awards. Congratulations writers! Birchwood School of Hawken's MathCounts team placed 3rd at the state level competition on March 9th. 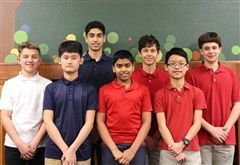 Led by their coach and school co-founder, Chuck Debelak, students John Shin, Ehren Collins, James Mamone, and Aidan Berard proudly represented their school’s strong math program. John Shin finished in 12th place individually. On March 2 the 25-member Science Olympiad team traveled to Case Western Reserve University to compete against 13 Greater Cleveland area teams. Each team is comprised of fourth through sixth grade students. The competition includes 25 events that test knowledge of various scientific topics and engineering skills. The Birchwood Team placed 2nd in Division A! Congratulations for this record winning performance! 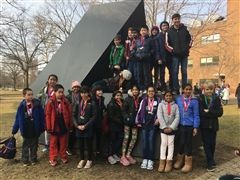 On Saturday, February 23rd, Birchwood School’s MathCounts team placed first in the chapter round of competition at Cleveland State University. In one of four challenging levels, the countdown round (where speed and accuracy are tested), the team also placed first. In addition, three students placed individually: Ehren Collins placed 3rd, John Shin placed 4th, and Aidan Berard placed 6th. MathCounts is a national competition that gives middle school students the chance to compete against their peers leveraging camaraderie and rivalry to make math fun. More than a quarter-million students participate each year with competitions held in all US states and territories. 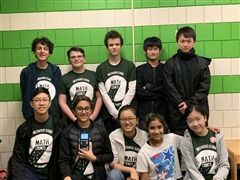 Their coach and Birchwood’s co-founder, Chuck Debelak, attributes the team’s success directly to their hard work saying, “They have been practicing challenging math problems on Thursdays and Saturdays since mid-October.” The team has earned their place at the state level competition on March 9th. The prestigious Scholastic Writing Awards has been celebrating students’ vision talent and creativity since 1923. Their mission is to identify teens with exceptional artistic and literary talent and present it to the world. We are so honored to have northeast Ohio students recognized in this way. Birchwood’s 4th grade class received the Team Achievement Award in the 2018 Noetic Learning Math Contest. This award is given to teams who place in the top 10% of participating teams. 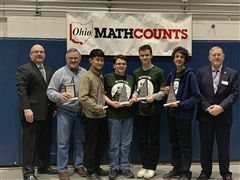 These young mathematicians also placed first out of all Ohio teams. Four students also earned National Honor Roll recognition: Manya Raina, Joshua Gordon, Ayat Jaffar, and Ted Alten. PowerUp Puerto Rico! is now paying off for the students and teachers forced to restart after Hurricane Maria. 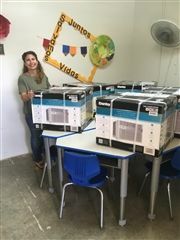 An elementary school in San Juan, Puerto Rico recently installed new air conditioning units. Another elementary school in nearby Guaynabo is soon to build a new playground. Both improvements are the big imprints of Birchwood’s helping feet. Six months ago, Birchwood students together took over half a million steps in their gym classes and raised $4,218.68 for Puerto Rican schools. The effort was muy grande, with 166 students participating. The average steps per student in a single gym period (as counted by pedometers) was 3,173. The giving of families was muy generoso, eventually tallying to $4,218.68. Que magnifico! Congratulations to John, an eighth-grade student at Birchwood School of Hawken and resident of Richfield, for being named one of 2018 Top 300 Broadcom MASTERSfor his project on predicting Geomagnetic Storms with GPS. 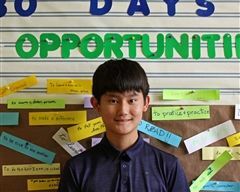 He was recognized on September 5th when The Broadcom Foundation and Society for Science and the Public announced the top 300 middle school students nationwide in the 8th annual Broadcom MASTERS, the nation’s most prestigious Science, Technology, Engineering and Math (STEM) competition. Winners were selected from 2,537 entrants who qualified by being among the top 10 percent of participants in Society-affiliated science fairs. Birchwood School of Hawken students and parents gathered together on the morning of Wednesday, May 16 to celebrate the achievements they have earned throughout the 2017-2018 academic year and also to recognize the support each student has received from their family. Congratulations to the members of the Birchwood Bach Quartet – Joseph D., Ehren, Hope, and John – on their third prize win in the 3rd edition of the global competition for young performers of The Music of Germany & Austria. 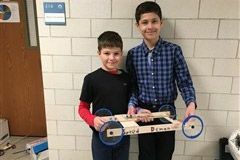 On March 17th a group of Birchwood School of Hawken students participated in the Western Reserve District 5 Science Day. This is one of 16 district fairs held each spring by the Ohio Junior Academy on Science. The five students who received a superior rating will be heading to the State Science Day in Columbus on May 12th: Joshua S., Praveen, John, Van, and Rohan. Birchwood School of Hawken was represented by a group of seventh and eighth grade students at the Northeastern Ohio Science and Engineering Fair (NEOSEF) which was held on March 12-15 at Cleveland State University. Approximately 600 students from over 80 schools discussed their science projects with over 260 judges and competed for more than $20,000 in prizes. 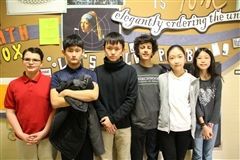 Birchwood’s MATHCOUNTS team placed second in the local Chapter Competition on Saturday, Feb. 17. This placement entitled the team to attend the State Competition on Saturday, March 10 in Columbus. At the state level Birchwood’s team placed eighth out of 100 schools competing. On Saturday, March 3, 38 sixth- through eighth-graders competed in the district level of the National History Day competition. Held at the Cleveland History Center and Case Western Reserve University, it proved to be an exciting day! With very strong competition this year, 19 students still qualified to advance to the state competition on April 21 at Ohio Wesleyan University. Birchwood’s Geography Bee class champs from grades 4-8 rolled out their mental maps in the schoolwide National Geographic Bee on Jan. 23. The 2018 Scholastic Awards for middle and high school students recognizes writing that shows originality, personal voice, and technical skill. 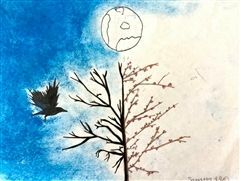 Out of all the grade 7-8 students who participated in the Northeast Ohio region, 10 Birchwood students were recognized. 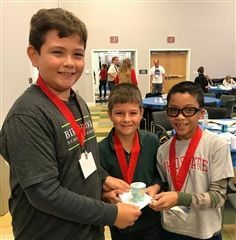 A team of Birchwood students in grades 5-8 competed in the annual Young Astronauts Day at the NASA Glenn Research Center on Saturday, Oct. 28. Students were divided into two groups the Pilot Team and the Commander Team before spending the morning competing in hands-on activities related to engineering problem-solving skills. 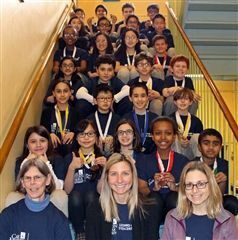 The Science Olympiad was held on March 4, 2017 at Case Western Reserve University with a 23-member team from grades 4-6 representing Birchwood School of Hawken. Birchwood’s 37 sixth through eighth grade students who took part in the National History Day District Contest garnered phenomenal results. 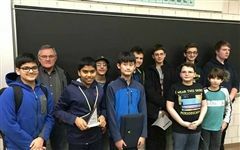 The Northeast Ohio MATHCOUNTS Chapter Competition was held on February 18, 2017 with the Birchwood School of Hawken team placing third out of 16 teams.